A discussion with Neil ‘Bigmista’ Strawder of Bigmista’s Barbecue. We talk about his BBQ roots, his favorite meats, his TV appearances on TLC’s BBQ Pitmasters and CBS’s The Ultimate BBQ Showdown, and he even shares some dating tips out of his book! Plus, I review Backyard Grill’s Gnarly Knucklebuster Hickory Habanero Sauce. 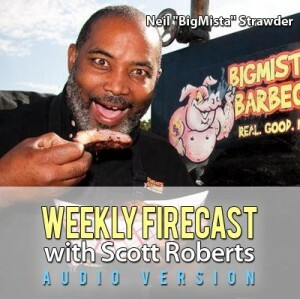 Download this episode | Subscribe via iTunes | Subscribe via RSS FeedCopyright 2011 ScottRobertsWeb.com.